October 11, 2018Comments are closed. This post is sponsored by Athleta Girl, but all opinions as always are my own! Today October 11 is the Day of the Girl. 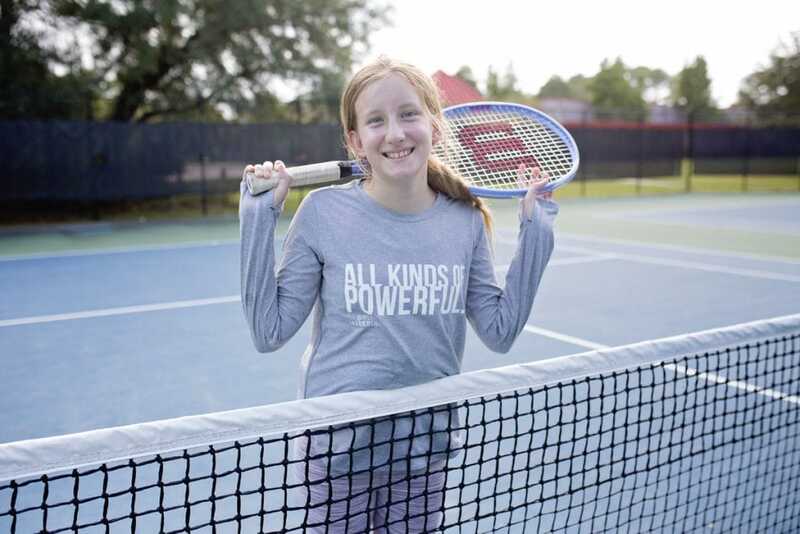 Athleta Girl is celebrating our powerful girls by donating the proceeds from this tee and sweatshirt with the amazingly powerful message “All Kinds of Powerful” to support girls leadership. Piper and I are obsessed with the efforts of Athleta Girl and their girlsleadership.org website. It has amazing tips for girls and parents of girls. There are tips to support her in every aspect of her life. 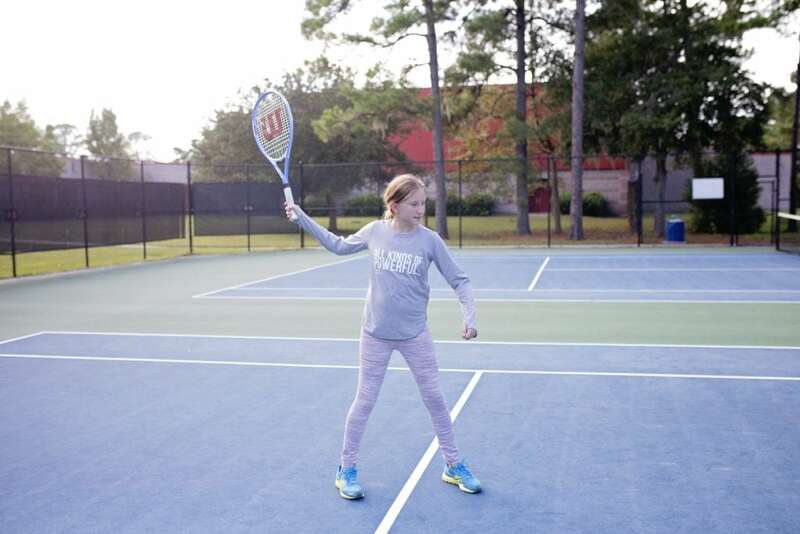 There are tips for girls to stay in the game and power through struggles and challenges. Be honest. Using her power may not always make her the most popular. But when she speaks her truth, that price is usually worth it. This message is so poignant to us right now. Middle school is hard. Life is changing. People are changing. But if Piper stays true to herself, she will make it through with more POWER than she started. 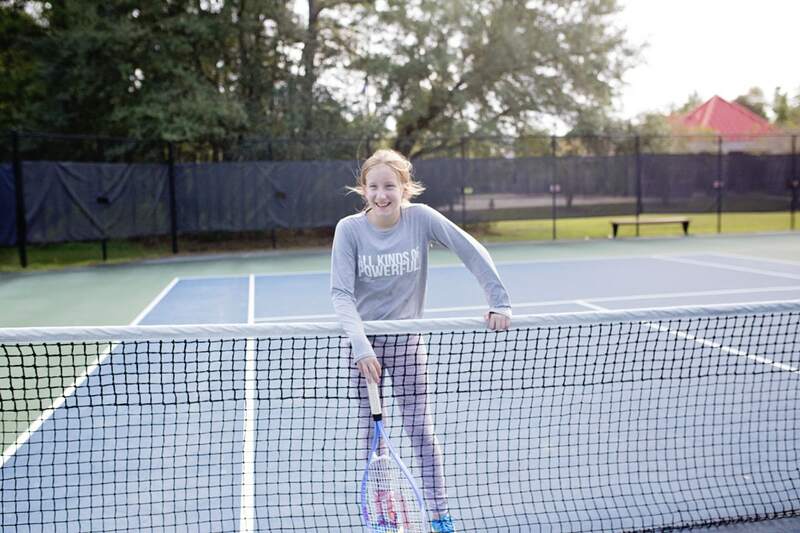 She’s new to the tennis team. I wrote about it in our last Athleta Post (HERE). The other team members have been together since kindergarten it seems, but she’s slowly winning all of them over with her adorable blunt spunky personality. FOR HER: If it’s important to you that your girl stays active, be her #1 role model. Get out there with her for bike rides, be the first one in the pool, dance at home with her, take her hiking, practice pitching, catching. FOR YOU: Find ways to work activity into things you already do: ride bikes to school instead of driving her or dance your way through weekend chores together. Join her has been my favorite tip. Piper has two younger brothers that take up so much of my time. I’ve consciously started joining her in activities that are just us. It’s given us more time to talk and she laughs at me so much. I love her laugh. This tip has been amazing for our relationship and I feel that it’s only going to make our mother daughter bond stronger as she gets older. From 9/20 through 10/31/18, Athleta is donating a portion of the proceeds from the sale of the limited-edition Girls Leadership “All Kinds of Powerful” long-sleeve t-shirt and pull-over hoodie. They have a goal of donating 10,000 dollars to our girls! The long sleeve t-shirt is adorable and long for extra coverage! Piper loves the thumb holes in many of Athleta’s products. She wears it over her workout gear on hot days and it’s going to be perfect as we head into the fall! TO Buy this amazing shirt or find out more CLICK HERE.